There's no shortage of strange things that have made their way into sports cards. But mascot fur is a new one. 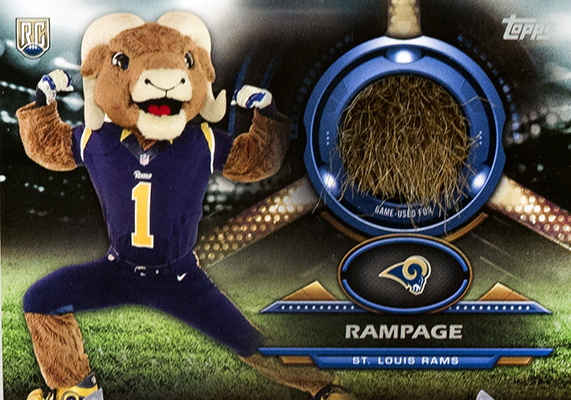 The St. Louis Rams and Topps have partnered to create a relic card with "fur" from Rampage, the team mascot. The special card won't be available at stores though. It has been made exclusively for members of the Rams Kids Club. Besides the Rampage card, Topps has also made a set of eight cards called Defend Our Turf where Rams players are imagined as superheroes. Defend Our Turf packs are available while supplies last at the Rams Kids Club table (Section 101) during their December 11 and December 21 home games. "The St. Louis Rams take pride in being innovative and family focused," St. Louis Rams fan engagement and senior mascot coordinator Clint McComb said in a press release. "We wanted our Kids Club Package to include something no other team has offered and our hope is that the Rampage fur card will really excite our young fans." "We love getting cards into the hands of kids and having them experience the thrill of opening a pack. They can share those moments with their parents who did the same at their age," said Topps' Clay Luraschi. While the Topps Rampage fur card is exclusive to Kids Club members, five autographed versions will be given away by the Rams on Twitter as well as Rampage's Twitter and Facebook.